Last November, the American people voted overwhelmingly to put this country on a different path. 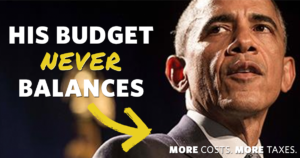 With this budget, President Obama is further entrenching himself in old, wasteful, and rejected ideas. Today, House Majority Leader Kevin McCarthy announced the formation of a new working group to continue to build on patient-centered health care solutions with which to replace Obamacare. As the House looks forward to reviewing this legislation and sending it to the President’s desk, I urge the President to reconsider his veto threat and to not obstruct the people’s priorities.